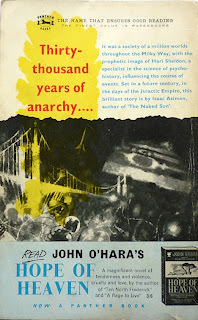 It's been a while since I've blogged about the Lewes Book Fair and the books I've bought thereat (is "thereat" even a word...? ), chiefly because despite attending almost all of the fairs over the past year or so (apart from the one in May, due to little Edie choosing that weekend to make her grand entrance), I didn't buy a single book (this 1958 third impression of the Hart-Davis edition of Ray Bradbury's The Illustrated Man was, I believe, the last thing I got there). However, that dry spell was broken at Saturday's (12 October) event – the final one of the year (there were, I think, only four this year, as opposed to the usual five) – when I came away with three vintage paperbacks for a pound a pop, plus some kids' books; so before we get to those promised Elmore Leonard posts, I thought we could take a look at wot I got. 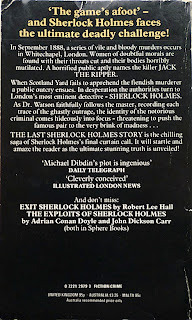 A 1980 first Sphere paperback edition of Michael Dibdin's debut novel, The Last Sherlock Holmes Story, originally published in hardback in 1978 by Jonathan Cape. 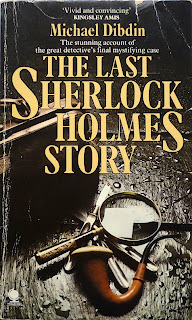 I'm not quite sure why I decided to purchase this, given that my interest in Sherlock Holmes extends to Steven Moffat and Mark Gatiss's Sherlock and not much farther, and that I still have umpteen Dibdin first editions – the majority of them Aurelio Zen novels – to read and blog about (the only ones I've covered thus far are the Zen books Ratking and And Then You Die). 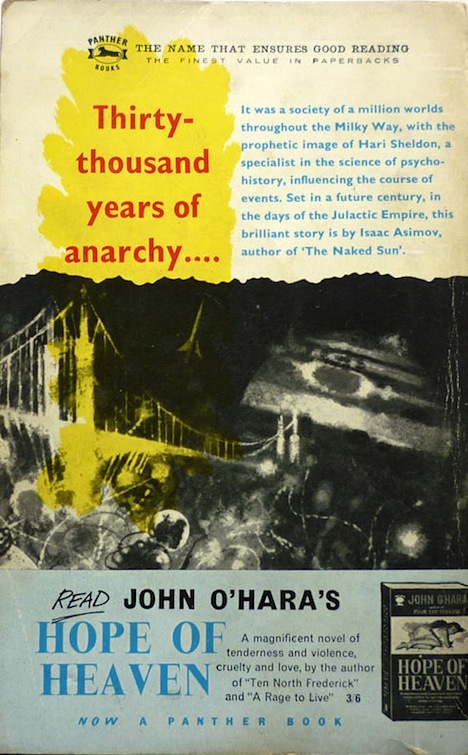 Maybe it was the Kingsley Amis blurb on the front cover wot did it – that and the fact that the book was only a quid, whereas a first edition would be more like sixty quid (and probably more). 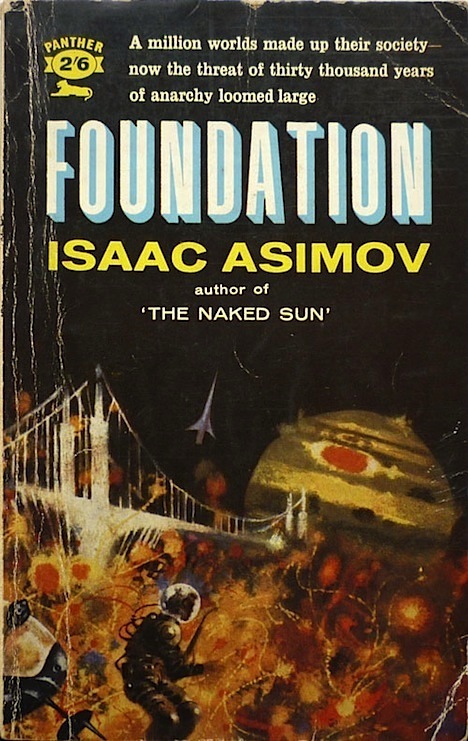 A 1960 first Panther paperback edition of Isaac Asimov's Foundation, originally published in hardback in 1953 by Weidenfeld & Nicolson. I have a habit of occasionally picking up cheap paperback editions of science fiction classics with a view to, at some point, in some mythical future era where I miraculously have hours and hours of leisure time at my disposal (not retirement, before you suggest that; I doubt I'll ever be able to afford to retire), finally getting round to reading them (see also Brian W. Aldiss's Non-Stop). Never gonna happen, obviously, but dammit I can dream, can't I? 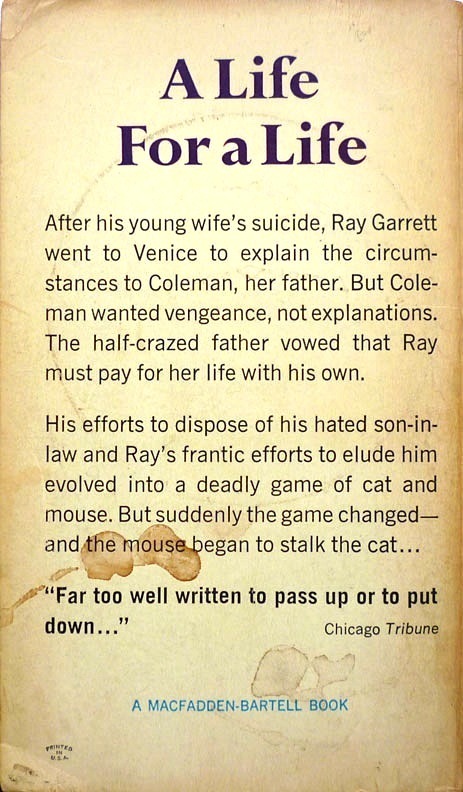 The cover artist, by the way, is unknown (even to the illustrious Steve Holland) – as is the cover artist of the third and final paperback. 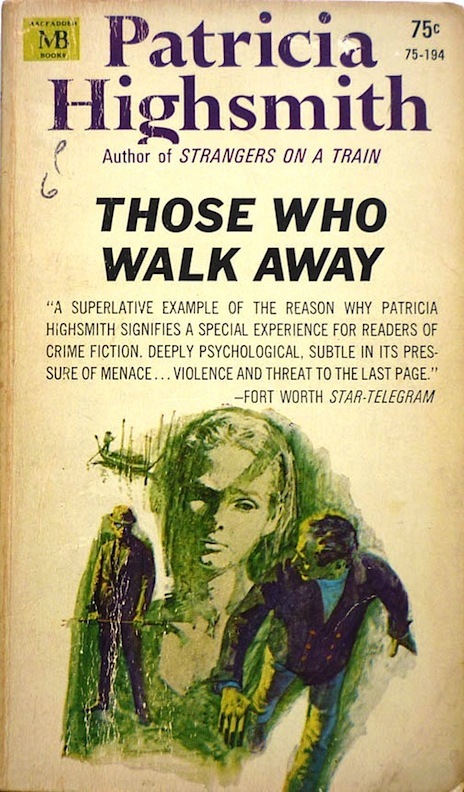 A 1968 first Macfadden paperback edition of Patricia Highsmith's Those Who Walk Away, originally published in hardback in the States in 1967 by Doubleday. 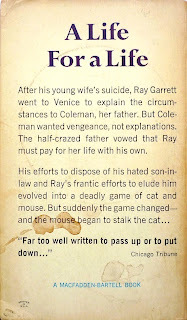 This is my prize score from this bunch; unlike the other two paperbacks, which were published by British outfits, this one was was published by an American imprint, which, in conjunction with the fact that it's pretty scarce – there are at present just four copies on AbeBooks, all offered by US sellers – makes it quite unusual in the context of it being found at a provincial British book fair. 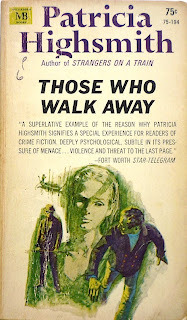 I actually already own the novel in its 1967 UK Heinemann edition – see the recently established Existential Ennui Patricia Highsmith First Edition Book Cover Gallery – but such is my passion for Highsmith I couldn't resist nabbing this too, especially for a pound. 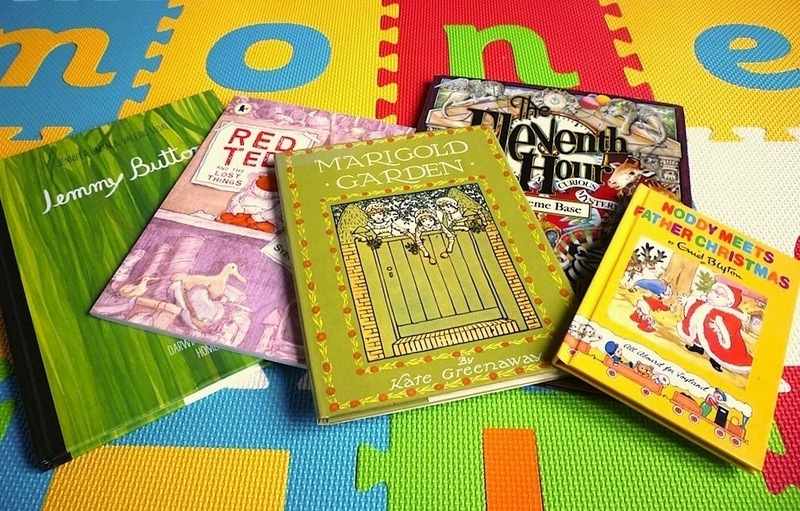 Left to right we have Jemmy Button by Jennifer Uman and Valerio Vidali; Red Ted and the Lost Things by Michael Rosen and Joel Stewart; Marigold Garden by Kate Greenaway; The Eleventh Hour by Graeme Base; and Noddy Meets Father Christmas by Enid Blyton. (That last one we're of course keeping in reserve for Christmas.) Phew. As Bruce Forsyth was once wont to say: didn't she do well? 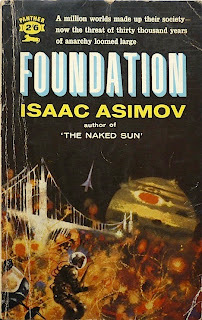 Nick, you got a pretty good haul of vintage books particularly the Isaac Asimov paperback. I haven't read his stories for a long time. Great score on the Highsmith. As a parent, I'll tell you that you'll spend even more time looking at the Graeme Baese book than the kid will. 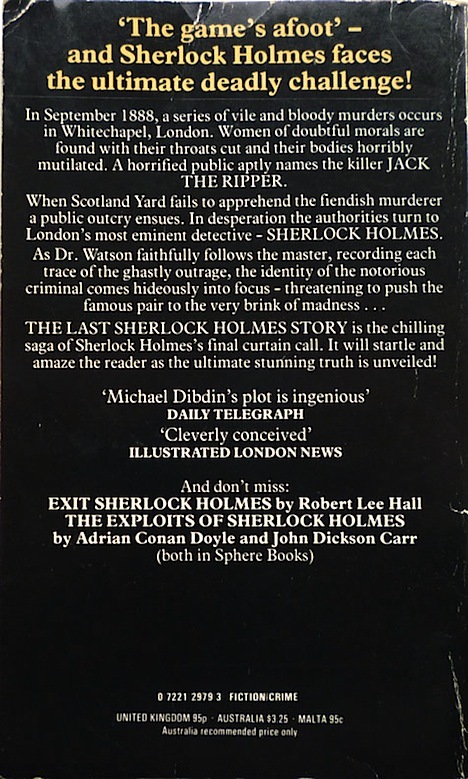 DO read Michael Dibdin's "Last Sherlock". 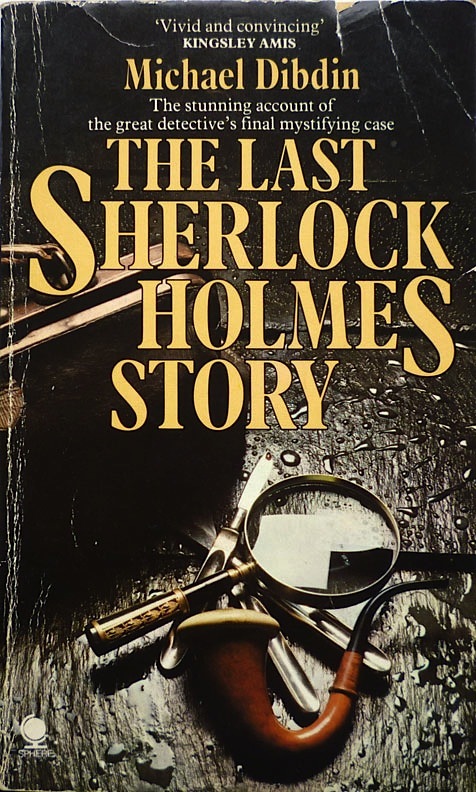 It's very funny in places and when it came out did a great job of ruffling feathers among dedicated Sherlockians. Kelly: having flicked through it, I can well believe it. That Amis quote is highly selective. Oh really? Crafty publishers. Is Amis's review online anywhere? I've not seen it online. I read it in "The Amis Collection"